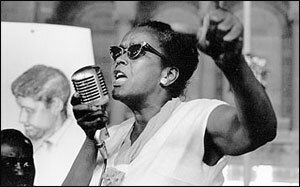 YPP was founded and continues to conduct its work in the spirit of Ella Baker. Ella Josephine Baker (December 13, 1903 – December 13, 1986) was an African American civil rights and human rights activist beginning in the 1930s. She worked alongside some of the most famous civil rights leaders of the 20th century, including W. E. B. Du Bois, Thurgood Marshall, A. Philip Randolph, and Martin Luther King Jr. She also mentored then-young civil rights stalwarts such as Diane Nash, Stokely Carmichael, Rosa Parks, and Bob Moses. 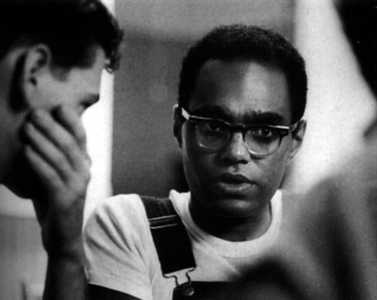 Bob Moses, originally from New York, became a field organizing secretary for the Student Non-violent Coordinating Committee (SNCC) in the Mississippi Delta region. He was a key player in pivotal actions such as Freedom Summer and the Mississippi Freedom Democratic Party, which famously demanded to be seated at the 1964 Democratic National Convention on live television. Moses went on to found the predecessor of the Young People’s Project, the Algebra Project, in 1982, stating that math literacy had replaced voting literacy as the key to full citizenship for Americans from poor and racial/ethnic minority communities. Awakened by the actions of young people, Bob travels to the South. As field secretary for the SNCC and director of SNCC’s Mississippi Project, he registers black voters and helped to organize sharecroppers to make a historic demand for political access. Delegates from the Mississippi Freedom Democratic Party make a historic demand to be seated at the Democratic National Convention. Moses utilizes funds from his MacArthur Genius Fellowship to create the Algebra Project (AP), with a commitment to improving educational and economic access through math literacy. The Flagway™ Game is developed by Moses. Omo Moses, Taba Moses, Khari Milner, and students from Brinkley Middle School (Java Jackson, April Davis, Melvin Bell, Durrell Moore, Sammie Myers, Antonio Allen, Shameka Shelton, Nate Young, and Demetrica Gorden) begin thinking about a model for a youth-led organization that centers around young people teaching each other mathematics. YPP is founded in Jackson, Mississippi, by current and former AP students at Brinkley Middle School. "I would take an idea from the youngest in the group if I thought it was an idea. My role was to facilitate, which didn’t involve leading. My ego wasn’t at stake, at any point, and I had found a greater sense of importance, by being a part of those who were growing. Whatever interests I had were primarily for people living in given situations to realize there was a strength they had within them, and by combined efforts, they could do something about whatever their conditions were that they wanted to see changed, but they first had to know what their conditions were and face the fact that nobody’s gonna do for you, that which you had the power to do and failed to do." After spending six years working with the Algebra Project in Oakland, Maisha Moses relocates to Mississippi to develop a training program for YPP. Mississippi Olive Branch Retreat takes place. First YPP Summer Training takes place. 15 students from Jackson, MS, spend the summer in Cambridge, MA, training local YPP students to do Math Literacy Work. The Spring Break Tours begin in Jackson, MS.
MLWs spend their spring break facilitating math literacy workshops. Their visits include: Weldon, NC; Charleston/St. Helena, SC; Washington, DC; Orlando, FL; Savannah/Atlanta, GA; and Birmingham, AL. YPP launches programs in Chicago during the summer, working with high school students through the Bank One Saturday Scholars Program. YPP hosts an organizational conference in Miami. The Program Evaluation & Research Group at Lesley University (Cambridge, MA) publishes a study comparing AP/YPP Brinkley graduates with the general population at Lanier High School in Jackson, Mississippi. The study found that AP/ YPP students: enrolled in 9th and 10th grade mathematics courses at a significantly higher rate; enrolled in college preparatory mathematics courses at twice the rate; and passed state mathematics exams at significantly higher rates. YPP hosts its first Math Bash at the University of Illinois at Chicago. YPP Jackson students begin working with the AP students from Douglass High School, and community members who were part of the Douglass Coalition in New Orleans to begin organizing around the idea of a Constitutional Amendment guaranteeing all children the right to a high quality education. This culminated in a historic meeting at Howard University in March of 2005 with students, educators, organizers and veterans of the civil rights movement. YPP receives funding from the National Science Foundation ($2.3 million over five years) to expand programs and support the development of its training program. “Within a month or so after the storm, Omo Moses and activist leaders from more than 100 organizations met in South Carolina to discuss how they could address the needs of Katrina evacuees. It was here that Moses introduced the idea of "Finding Our Folk. "[Chris] Adagbonyin headed up the initiative, and with little money and no concrete direction, he began searching for displaced people living in Jackson. His search led him to Jackson State, where he discovered that people needed to share their sto- ries just as much as they needed other resources. We really just wanted to be a physical presence for people"
YPP opens a Boston office in the Fields Corner, Dorchester, neighborhood, establishing a base for programming in the city. YPP begins the Flagway™ Campaign, seeking to create a context in communities throughout the country for students to practice and celebrate learning math. YPP expands to include programming in Petersburg, VA, Miami, FL, and Atlanta, GA. The AP national conference engaged youth and adult participants in facilitated small and large group discussions, working sessions, and interactive activities. The overall goal of the conference was to rigorously evaluate the requirements and strategies needed to create a quality public school education for all students. Leadership Development Institute - Jim Burruss (from the Hay Group) begins working with young men in YPP to develop their leadership capacity. YPP Miami is started in August. In its first two years; YPP Miami worked within six elementary schools throughout Miami Dade County. 1st Annual YPP Hamptons Fundraiser is held. YPP Los Angeles is started within Academia Avance Charter School. The first in a series of cultural showcase and social justice network building events that serve to highlight the creativity and leadership of New Orleans youth while connecting community members with local social justice organizations that offer important information and services, as well as advocacy and empowerment opportunities. YPP @ Hamilton College is developed by YPP students and serves as a model for engaging colleges students in education and education reform work. Second Leadership Development Institute is held. YPP Participants: April, Lekecia, Lori, Maisha, Sharayna, Krystal, Quinn, Selledia YPP partners with Lawrence Community Works to launch Neighbor Circles. YPP begins a comprehensive strategic planning process supported through a $1.2 million grant from Atlantic Philanthropies. YPP launches its first Year-End Fundraising Campaign to establish strong support from our communities across the country and raises $60,000. YPP completes its business plan for enduring social impact. Root Cause indicates YPP is one of a handful of peer-to-peer programs nationally that combines training in math or science with educational advocacy and reform, and may be the only such organization largely founded and conceptualized by African American middle-school students. YPP sites join local organizing networks and coalitions in Chicago, Mississippi, and Massachusetts: Boston United for Students, Teens Lead the Way Civics Campaign, Massachusetts Coalition to end the Cradle to Prison Pipeline, Youth Jobs Coalition. YPP relaunches the QECR initiative over the last year and a half, and re-launched it as an organizational project at the SNCC 50th Anniversary. YPP begins the “We The People” tour in conjunction with the release of the book, Quality Education as a Constitutional Right: Creating a Grassroots Movement to Transform Public Schools, visiting 15 communities and universities to date. YPP Co-Facilitates National Youth Listening Tour Stops In Jackson, MS, Boston, MA, Ann Arbor, MI, Los Angeles and Chicago, YPP lead roundtable discussions as part of a nine stop National Youth Listening Tour, that sought to open a dialogue with youth from diverse experiences and backgrounds to discuss what it means to create a college-going culture at the family, community, and school level. The tour was lead by Alberto Retana, US Department of Education, Director of Community Engagement. GB - 2011 YPP began working in-class at The Young Achievers school in Boston around the Flagway curriculum. LA - 2010-11 YPP began a recovery credit class for Franklin students to earn five class credits by being trained in YPP curriculum and teaming up with Veteran Math Literacy Workers (MLWs) from Academia Avance to provide outreach to Monte Vista. NY - 2010-2011 With continued support of the NYC DOE 21st Century Fund and The Shelley & Donald Rubin Foundation, YPP has been able to successfully provide another year of programming based out of Boys and Girls HS in Brooklyn. "We believe that young people need to imagine their future, develop the confidence and capacity to be architects of it, as well as part of efforts to determine it. Math Literacy work is our entry point for developing young learners, teachers, leaders and organizers." This figure presents a schematized summary of the key elements of our theory of change with an abbreviated listing of short term and intermediate outcomes. It builds of the implicit assumption that elementary school children who leave the program after two years but do not return for high school – nevertheless will achieve the outcomes targeted for high school students due to their increased competencies and math self-efficacy. * This diagram was developed through a series of workshops with David Hunter. Mississippi - 90% of participants (working with 20 Math Literacy Workers) from YPP Saturday workshop improved math scores from one term to the next based on their report cards. Greater Boston – In 2015, YPP Greater Boston offered programming at the Fletcher Maynard Academy in Cambridge, the Higginson-Lewis and the Mason Schools in Roxbury, in addition to adding a new site, the Dudley Street Charter School also in Roxbury. Four MLWs graduated and are now enrolled in college and 1 of the 4 transitioned into a College MLW role with YPP. The GB team hosted two Culminating Events, two open houses, a Math Bash, a Steam Day, and a Coding Camp. In addition, they presented at the NCTM Conference in Boston and The Pittsburgh Colloquium. Chicago – In 2015, Chicago employed 15 MLWs and had a higher average in daily attendance (101.1%) and a higher retention rate compared to the average of other non-YPP afterschool control programs. A majority of the Chicago MLWs (90.6%) disclosed that they have gained profound academic and career related skills. Michigan – Michigan continued to recruit MLWs from Ypsilanti Community High School, Wayne Memorial High School, John Glenn High School, Romulus High School, Tri-County Educational Center and continues to hold a steady relationship with Marshall Upper Elementary, Adams Upper Elementary, Estabrook School, Key Elementary, Romulus Middle School where they provide outreach. Five MLWs have graduated and three are enrolled in college. We are thankful for the many partnerships that serve as the driving vehicle for our work. In May of 2015 YPP partnered with AP to take the Flagway™ Games to Ireland, and were invited to return in the spring of 2016 by the National Council for Curriculum and Assessment to establish Flagway™ as a knowledge based sport. Education Testing Service (ETS) – ETS is a collaborator with YPP on a proposal to the National Science Foundation to implement, research, and evaluate a comprehensive YPP program in three schools in Greater Boston, Jackson, and Chicago. If funded, ETS will host annual research gatherings at its conference campus in Princeton, NJ. YPP welcomeD Naama Lewis to the National Team as the Director of Training. Naama has a long history with YPP starting as a CMLW in 2003 and being a key player in YPP’s curriculum and module development. We believe her personal experience with YPP along with her educational background in pure mathematics, math education, biomechanical engineering, and statistics is a perfect fit to meet the training needs of YPP.